1. Be ready early and download the Lazada app. Readiness is your best protection. Keep up with the action so you don’t miss out on a preview of the best buys. Also keep an eye on the awesome deals in the Taobao Collection, on Nov 8th – 11th . Just make sure you enable your app notifications! 2. Fill up your Wishlist. Whether they are must-haves or good-to-haves, log them down in the Wishlist function on your Lazada app. By doing so, you’d be alerted to great deals on the products you’ve wished for and be rewarded with massive savings. Putting all your items into your shopping cart days before 11.11 frees you up to browse through more items and hunt down the best deals. So once the sale starts when the clock strikes 12, all you need to do is hit check out immediately. 4. Use the right credit cards / e-wallets. Enjoy further discounts when you pay with cards of banks like CIMB Bank, RHB Bank , Maybank, Citibank, HSBC and select more. Check the Lazada website or app for the most updated bank codes. 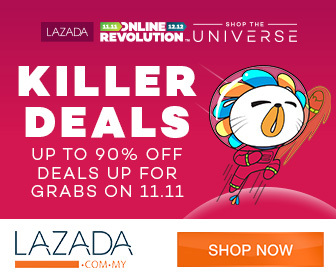 Just enter the codes at the Lazada checkout page to enjoy the discount great discounts! Log on and keep checking back. When the deals drop at 12 midnight on 11.11 (Nov 11), you want to be the first to click or tap to get massive savings on that perfect dress, lipstick or pair of shoes. That’s not all. You also want to be on the lookout throughout the day for the millions of deals that will be up for grabs. They include bi-hourly flash sales, buy-one-get-one-free promos, deals as low as RM1 and discounts of up to 90 per cent! Definitely out of this world! Get up to RM 200 off when you purchase a Lazada Gift card for exclusive usage on 11.11. Check it out here! 7. Spot Taobao Collection’s hot-selling fashion and beauty item. With a massive 11 million products on offer up to 90% off in each of the five countries Malaysia that have access to the world’s biggest online marketplace – Tmall , you will no doubt find something trendy in this well-curated collection! After all, Taobao Collection is offering discounts up to 70% for international brands such as Folli Follie, Havaianas, Cache Cache & more! SCORE!!! 8. Unbox those surprise boxes. 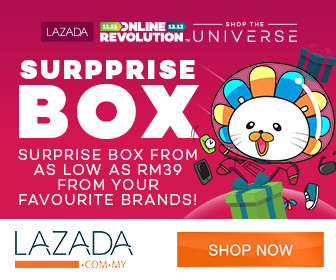 Life can’t get any better when you manage to snag yourself Lazada’s surprise branded boxes that will be on offer. Many of Lazada’s brand partners have specially curated boxes of goodies. No surprises here – you will love them. Psst, I heard there would be surprise boxes from Laneige, Seagate,Carlo Rino, Durex and many more! Lazada is currently offering free shipping for more than 80 million products The upshot? More savings for you. 10. Shop via online banking and be rewarded. Just purchase on Lazada via FPX (online banking) payment providers, submit a creative picture using the hashtag #FPXMOLPayLazada via your respective social media accounts and be in the running to win astronomical prices including Perodua Axia car, smartphone, tablets and many more!